In mid-June 2018, when the year’s Race Across America (RAAM) kicks off in Oceanside, California, Sumit Patil won’t be there. The Mumbai cyclist qualified for the event and registered for it but cannot go for want of funds. Sumit won’t be sitting idle. He has other plans up his sleeve. In Mumbai, Colaba is well known. It is the southern tip of the city; home to Gateway of India, the Taj Mahal hotel, the flea markets of the tourism district and the local military cantonment. With its popular pubs, longstanding eateries, the iconic Regal Cinema, the fish market at Sassoon Docks and proximity to other South Mumbai nodes like Churchgate, Nariman Point, Kala Ghoda and the Chhatrapati Shivaji Maharaj Terminus (formerly Victoria Terminus), Colaba is a place many in Mumbai visit once in a while. Beyond Colaba is the Arabian Sea, albeit a busy portion of it, for it is through the nearby shipping channel that ships headed for the region’s two major ports and naval base navigate their passage. That channel is a bit out to sea. Closer to shore are the sail boats, yachts and ferry boats. Not many people know Kulaba. Kulaba is the old name for Maharashtra’s Raigad district. As the crow flies, it is approximately 45 kilometers, south-south east of Mumbai. While Mumbai is a composite of islands, Raigad is on the mainland. The administrative headquarters of Raigad is Alibag. If Matheran and Mahabaleshwar are the hills Mumbai frequented to escape itself, then Alibag is where it went for sea and farm life. The city’s rich and famous are known to own property there. According to Wikipedia, the name – Alibag – is rooted in farming and plantations. The place was historic hinterland of Bene Israeli Jews. One of them, Ali, was a wealthy person owning plantations of coconut and mango. The region where he stayed came to be known as Alichi Bagh (garden of Ali in the Marathi language); over time that became Alibag. The first major industrial unit in these parts was the factory producing urea and chemicals, set up by Rashtriya Chemicals and Fertilizers Ltd (RCF), a company owned by the central government and having significant presence in Mumbai and Raigad. Born 1985, Sumit Patil studied at the school in RCF’s Alibag campus. His father worked at RCF while his mother was employed with India Post. He has a younger sister; she is now a doctor. “ Alibag was close to Mumbai. Yet it was so unlike Mumbai,’’ Sumit said. We were at a café opposite Mumbai’s famous Siddhivinayak temple, in the suburb of Prabhadevi. Although Saturday, the arterial road outside, linking South Mumbai to places like Bandra, Andheri and Borivali roared with traffic. Alibag was a vision in mind dreaming slow life. Life at RCF’s school in Alibag was interesting. “ We had two large football grounds and an Olympic size swimming pool,’’ Sumit said. He made use of it. He also took to swimming in the sea. These are possibilities hard to find in wealthier Mumbai with its congested environs. “ When I moved to Mumbai, I realized that most people here hadn’t enjoyed such facilities in their childhood,’’ Sumit said. Besides the facilities at school, Raigad provided options for hiking and star gazing. Having picked up cycling around the third or fourth standard, he recalled a memorable field trip facilitated by mobility on two wheels. A class on what taluka (an administrative division in South Asia) is came alive after the students cycled around their taluka for improved comprehension. Very simply put, in Alibag, free of overwhelming urban currents Sumit could indulge his childhood curiosities. The shift to Mumbai was gradual. Determined to join the armed forces and required to clear the relevant exams, he used to come to the city on weekends for coaching classes. Although in his eyes, the interest in the armed forces was a major influence shaping his life, in retrospect, that would seem to compete with another trend setting in strongly. From a very early age, volunteering appears to have captured his imagination. Among the first major instances of this was a multi-day cycle trip organized by Dnyan Prabodhani, a Pune based-school that saw Sumit and other students visit places ranging from Vigyan Ashram founded by Dr Shrinath Kalbag to the Giant Meterwave Radio Telescope to Ralegan Siddhi and its social activist, Anna Hazare, and a night climb up Shivneri fort, the birth place of Chhatrapati Shivaji Maharaj, founder of the Maratha empire. In all the students cycled some 600-700 kilometers taking a little over a week to do it. “ Today you would call it bicycle touring,’’ Sumit said. Uniquely, it wasn’t the cycling that left an impression. The take away for Sumit was the volunteering he saw at many of the places he visited. That and subsequent similar experiences, has left him deeply suspicious of and uncomfortable with commercial instincts in human activity, including sports. Following school education, Sumit joined Ruia College in Mumbai to do his graduation in Physics, following that up with MSc in the subject. Away from studies, two lines of interest characterized college days. To bolster his chances at joining the army, he stayed active in the National Cadet Corps (NCC). Within NCC, participation in the annual Republic Day camp is prized. Selected to go and adjudged best cadet from Mumbai Group Headquarters, the camp however eluded him as he came down with jaundice. But his desire to join the military was the strong. Over the years that followed, Sumit would attempt selection to the armed forces 13 times and be rejected at some stage or the other. He exhausted his last chance via these selection tests in 2012. He hasn’t given up hope yet; the final port of call is the Territorial Army, a second line of defence after the regular army, composed of volunteers. The other thing which happened during Ruia days was immersion in Mumbai’s hiking scene. According to Sumit, the attraction for hiking was as much outdoors as it was an opportunity to mimic the military, popularly associated with all things tough. “ You saw them as heroes and when you hiked, you walked a bit like them with rucksack on your back,’’ Sumit said laughing. Mumbai has many outdoor clubs with the local hiking season peaking during the rains. He didn’t join any of the clubs. He trekked with whoever came along. The hills and mountains would become a major influence in his life. In April 2001, he did his Basic Mountaineering Course from the Nehru Institute of Mountaineering (NIM), Uttarkashi. Sumit is a little unclear on what exactly pushed him into endurance sports. In 2005 he suffered a road accident in Alibag. He was on a two wheeler and was hit by large truck. The truck drove away from the scene; he was left unconscious on the road. Passersby ensured he was taken to the hospital. Among injuries, he had a fractured wrist and a broken mandible. Coupled with the consistent failure to get into the army, this was a trying phase. He admits he may have looked for release, an outlet to vent his frustration. From some years earlier, the Indian bicycle market had begun to slowly change. Firefox entered the market with bicycles that attracted for their design; they were also sold at swanky showrooms, another first in the trade traditionally associated with heavy, steel bikes and a retail format that paid little attention to customer. Firefox was also local distributor for Trek bicycles. The Firefox-Trek combination (Firefox has since been purchased by Hero Cycles and Trek now retails in the Indian market on its own) was the first whiff of change. By 2006, a large shopping mall that opened in Mumbai’s western suburbs had begun selling imported Raleigh bicycles. Sumit bought a Raleigh M-Trax, a MTB. Meanwhile in 2004, the Mumbai Marathon commenced. With all that exposure to sports in school, the intermittent cycling and his fondness for hiking, Sumit was a decent runner. He participated in the Mumbai Marathon’s half marathon segment in 2007, 2008, 2009 and 2010; his best timing across these years was one hour, forty two minutes. With this came another realization. Thanks to the RCF pool, he knew swimming from a young age. Alibag’s proximity to the sea had also ensured that he swam in the sea and held no fear for it. Now he was into cycling and running. Had the time come to attempt the triathlon? – That was the thought. Serendipity is a 2001 romantic comedy directed by Peter Chelsom; it stars John Cusack and Kate Beckinsale in the lead roles. Sumit liked this movie. In 2010, there was a triathlon announced in Goa. Event in mind, Sumit bought his first road bike. It was a Trek 1200 SL. He named it Sara after Kate Beckinsale’s character in Serendipity. As it happened, the triathlon didn’t take place that year. 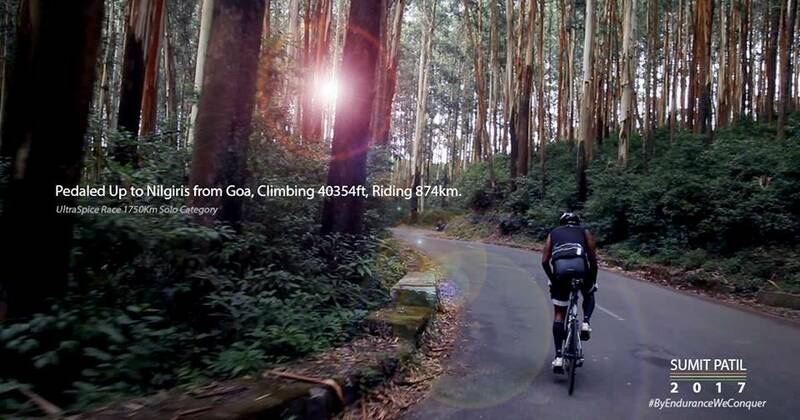 Given bike anyway bought, Sumit rode to Goa from Mumbai. On the third day of cycling, he heard a passing three-wheeler driver shout something about the road ahead. Sumit couldn’t understand what he said. Ahead was a series of badly built speed breakers. That was the end of Goa trip for Sara and rider. Sumit returned to Mumbai in a state transport bus, nursing his injuries. Sara lay lashed to carrier on the vehicle’s roof. In cycling, audax means audacious. According to Wikipedia, the first recorded audax cycling event took place on June 12, 1897; twelve Italian cyclists attempted to cover the 230 kilometers from Rome to Naples during daylight hours. As similar events gained popularity, a French journalist, Henri Desgrange, formulated rules and regulations for audax events. Riders rode as a group and successful rider were awarded a certificate called Brevet d’Audax. The onus of organizing events was assumed by Audax Club Parisiene (ACP). But following a disagreement, Desgrange withdrew ACP’s right to organize events using his regulations. The ACP created its own version of the sport with successful riders being awarded certificates called Brevets des Randonneurs. This format came to be popularly known as randonneuring. It has its own eccentricities. A brevet – which is how these rides are called – is not a race. No order of finishers is published; everyone is equal. Riders may ride alone or in groups. They are required to be self-sufficient between check points. To that extent, randonneuring is sometimes considered a cousin of touring. Brevets come in various distances and cut-off times. They are: 200 kilometer-brevet to be completed in 13.5 hours; 300 km / 20 hours, 400 km / 27 hours, 600 km / 40 hours, 1000 km / 75 hours, 1200 km / 90 hours (or 80 hours or 84 hours as the rider chooses) and 1400 km / 116:40 hours (or 105:16 hours or 93:20 hours). A rider who completes a 200 kilometer-brevet is called a randonneur. Brevets are many in the world but some are iconic. One of the most famous is Paris-Brest-Paris; started in 1891 and currently the oldest regularly held bicycling event in the world. It is held once in four years and to participate, a cyclist must complete a series of brevets in one year. The first thing Sumit did when he got back to cycling after the accident was, buy a helmet. He hadn’t been wearing one on the ride to Goa. To buy a helmet, he visited the shop run by Prabodh Keny. During their conversation Prabodh mentioned about an upcoming BRM (Brevets des Randonneurs Mondiaux), the first 300 kilometer-BRM being held in India, from Mumbai to Vadhivare near Nashik and back. The distance had to be covered in 20 hours. “ At that time, I was doing 100 kilometers in four to five hours. So I calculated in my head and decided 300 kilometers in 20 hours should be very doable. That was the first mistake; my first lesson in endurance – there is no mathematics in this madness,’’ Sumit said. 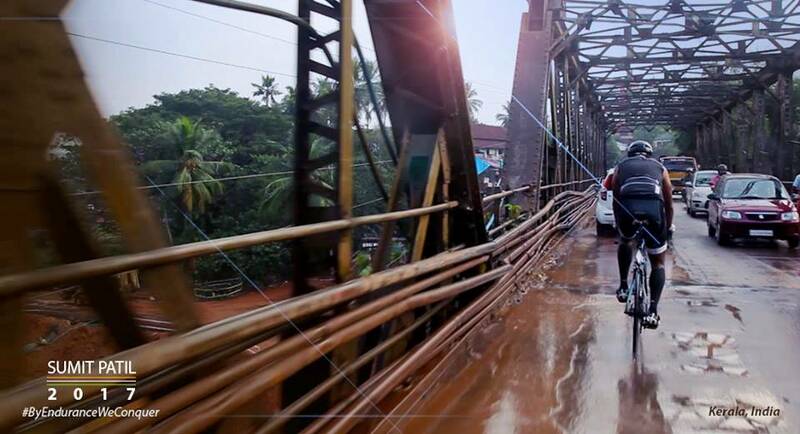 On the day of BRM, Sumit rode Sara, breezing past the first 100 kilometers in good style. That was when reality hit home – he had no clue about how he would fare for any kilometer following that first 100 kilometers as he hadn’t ventured past such distances at a stretch, before. It was a cardinal error – thinking that all the stages of a ride unfold similarly. Ideally, you should visualize the whole distance and plan your hydration, nutrition and pacing for each stage. Such ability is a product of experience and maturity; it comes from having lived life and having been out there cycling, for long. “ As Indians we specialize in racing straight off the blocks in a mad rush to be first. That is what we are taught at our schools. In the race between the hare and the tortoise we reserve our admiration for the hare. Endurance is all about being tortoise,’’ Sumit said. By the time, Sumit reached Kasara Ghat the BRM had become a killer for him. He tagged along with Raunak, a friend. Eventually he completed the BRM in 19 hours, 45 minutes. From finish line in Mumbai, he had to go to the RCF colony in Chembur in the eastern suburbs, where he lived. Utterly drained from the ride, he alternatively walked and cycled, treated himself to dinner at Chembur’s roadside food stalls and slept the exhaustion off. “ After this first BRM, I started attempting BRMs like anything. It was now familiar territory. The more I became aware of what I did, the more analytical I became. I then consulted the Internet for advice. It is awash with people’s experience and suggestions. You have to pick what is relevant for you and adapt it to your reality,’’ Sumit said. BRM was brought to India by Satish Patki, among Mumbai’s most respected cyclists. Now in his late sixties, interviews done with him and available on the Internet say he splits his time between the US and India. Satish is more than cyclist. According to published articles, he has a background in mountaineering and has indulged in a variety of adventure and endurance sports. The first BRM Sumit went for was the second BRM Satish organized. Sumit remembers being overtaken very early in the BRM by this much older cyclist, who he saw next only at the finish line. 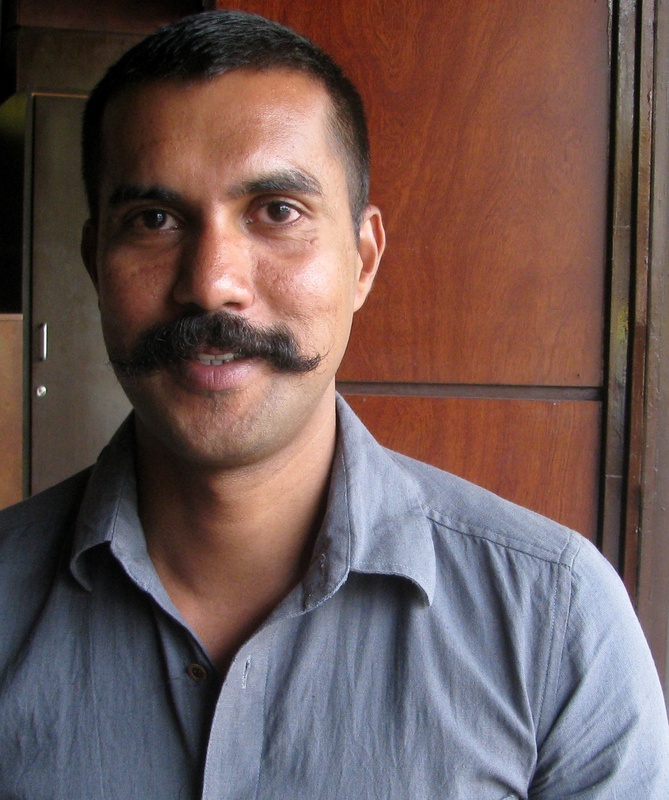 Satish was what endurance cycling was all about. He had tonnes of experience, he had the required maturity to assess a route and plan his strategy. “ Satish was older than many of us youngsters recently entered into distance cycling. Yet he was so much stronger and better than us that pretty soon, we knew, he was the guy to beat. Satish used to finish two to three hours ahead of the rest. For us the only goal was to beat this veteran. How was he managing to finish so? ’’ Sumit said. Listen carefully to Sumit’s talk and you understand this wasn’t competition with another person. Newcomers, in their attempt to improve, seek external benchmarks. For Sumit, his first such quest was to be as good as his friend Kaushik Iyer, who had more experience in cycling and had done a Tour of Nilgiris before the two started attempting BRMs together. Beyond Kaushik, the person to catch up with was Satish. Sumit considers Satish his mentor. Their camaraderie has seen its share of ups and downs. 2010 was a busy year. Sumit kept attending BRMs regularly. He also planned a cycle trip from Alibag to Leh. That plan had to be abandoned following cloud burst in Leh. But around this time, he read an article about Samim Rizvi in the media. 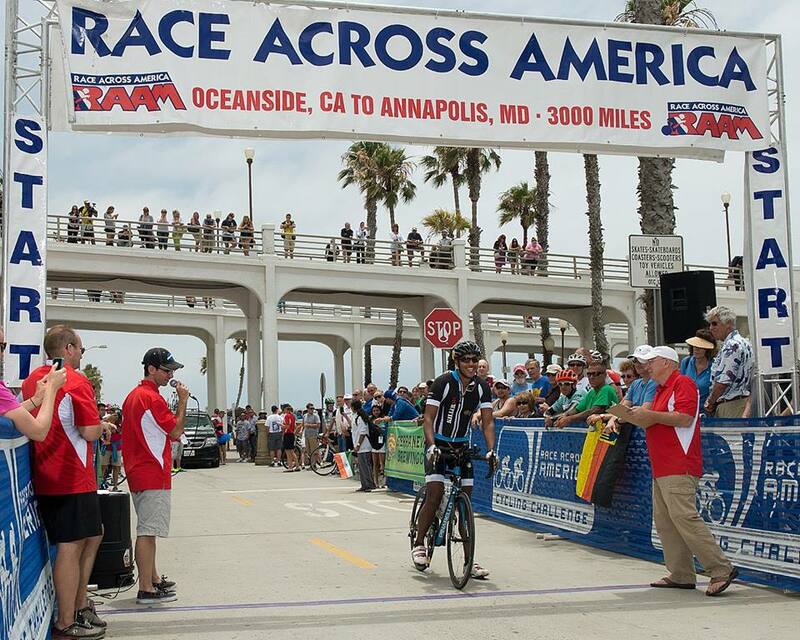 Samim, who hails from Mumbai but lives in Bengaluru, was the first Indian to attempt Race Across America (RAAM). It is a 4800 kilometer-long ride across the US, from west to east, with the winners typically finishing it in eight to nine days. As he gathered more information on RAAM, the race captured Sumit’s fancy. Same year, a 600 kilometer-BRM with 40 hour-cut off – from Pune to Kolhapur to Lonavala and then back to Pune – occurred. Sumit and Kaushik finished this BRM by cut-off. “ Those days BRMs had an accommodative ambiance. It wasn’t about competition. Riders helped each other. They looked out for each other. They left none behind,’’ Sumit said. Nevertheless one thing he had to do to feel good about his abilities was beat the maverick; which he did at a 2011 600 kilometer-BRM from Mumbai to Ratnagiri and back. Sumit passed Satish at Mahad and reached Ratnagiri two to three hours ahead. On the return leg from Ratnagiri to Mumbai, which was after some rest, they rode out together. Sumit was now at peace. He knew what he can do. Satish told Sumit to go ahead, for the BRM was opportunity to ensure a slot at the upcoming edition of Paris-Brest-Paris (PBP), subject to qualifying in 2011. Sumit eventually finished the BRM three hours before cut-off, earning his slot at PBP. He subsequently qualified for PBP as well. Then the young man in him set about complicating the opportunity. At the Pune-Kolhapur-Lonavala-Pune BRM, one of the participants was Samim Rizvi. That BRM had been opportunity for Sumit to talk to Samim and get acquainted with RAAM. However he didn’t mention his own interest. He researched RAAM more and found an imminent avenue to qualify. PBP offered three options for participants – you could sign up to complete it in 80 hours, 84 hours and 90 hours. Sumit found that there was a provision at PBP, whereby if you finished it in 64 hours, you qualified for RAAM. An old bug – the sort that had bitten him just ahead of his first BRM – got to Sumit. While most others from Mumbai signed up for 90 hours, Sumit signed up for 80 hours. Others tried to talk him out of it to no avail. Then to compound matters, his visa for France got delayed. He reached France with less than 24 hours for PBP to start. By the time he got to the venue the riders aiming for 80 hours had already cycled off. He was allowed to ride with the 84 hour-group but it was hopeless. His ride was terminated at Brest. Sleep deprived from having reached the venue straight from airport and tired by the cycling that followed, he was hallucinating, mistaking Brest’s architecture for Mumbai’s CSMT. That year, there were two Indian finishers at PBP – Samim and Kailas Patil. After the 2011 PBP, Sumit continued to go for BRMs. But his interest was slowly waning. The first BRM he went for after PBP was a 200 kilometer-trip. In due course, Satish stepped down as organizer and a new set of organizers took over. While he didn’t articulate it as such, it was clear from Sumit’s talk that among reasons for his fading interest in local BRMs, was the event’s own maturity, a process that progressed in tune with cycling’s growing popularity in the country. In any sport, such progression is characterized by love for camaraderie and purity of sport in the beginning. Then as the movement gathers momentum, the original values rust a bit. “ I kept going for BRMs despite my receding interest because the mileage all of us put in matters for country at PBP,’’ Sumit said. As per rules, the more the cumulative mileage earned by cyclists completing BRMs in a given country, the more the slots allotted to that country at PBP. At a 600 kilometer-BRM – his third time at Pune-Kolhapur-Lonavala-Pune – Sumit’s disenchantment eventually caught up with him. Some 180 kilometers ahead of finish, he got off the bike, handed over his energy bars to his friend and sat by the road. He was done. An antidote for the obsession with competition in India is to stretch endurance so much that completion itself becomes a daunting task. As his fancy for BRM receded, RAAM grabbed attention in Sumit’s mind. It was an ultra-endurance event. He qualified for RAAM at the 2013 Ultra Bob, a RAAM qualifier in India conducted by Globeracers. 2013 was also the year another portal to opportunity presented itself. That year, Sumit started working as volunteer with Youth Hostels Association of India (YHAI). His job was to shepherd YHAI’s clients attempting to cycle from Manali in Himachal Pradesh to Khardung La, the high mountain pass near Leh. This is high altitude landscape. Cast into volunteer mode, a style of work he has had considerable respect for since childhood, Sumit liked the assignment. YHAI charged a fee that was much lower than many private operators. The approach appealed to Sumit, who has an ideological disagreement with steep sums of money charged for adventure activity that results in those who are talented but not wealthy, being unable to try it. The work gave him considerable satisfaction. Sumit wishes for those entrusted to his care to have done their homework and prepared in advance for the trip. Thereafter, if someone struggles, he helps by giving them company. Sumit has been YHAI’s point man for the Manali-Leh trip for many seasons. In turn, it has meant prolonged cycling at altitude. 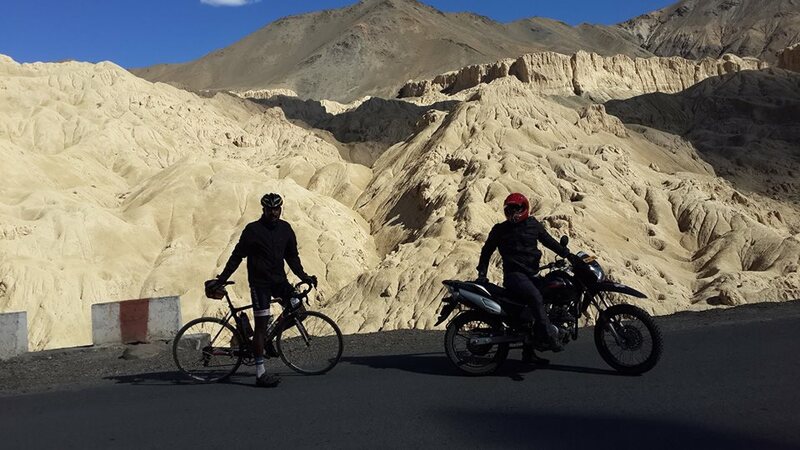 He stays in Leh for a few months every year and ends up doing the Manali-Leh cycle trip two to three times. An endurance monster like RAAM wasn’t therefore a shot in the dark. 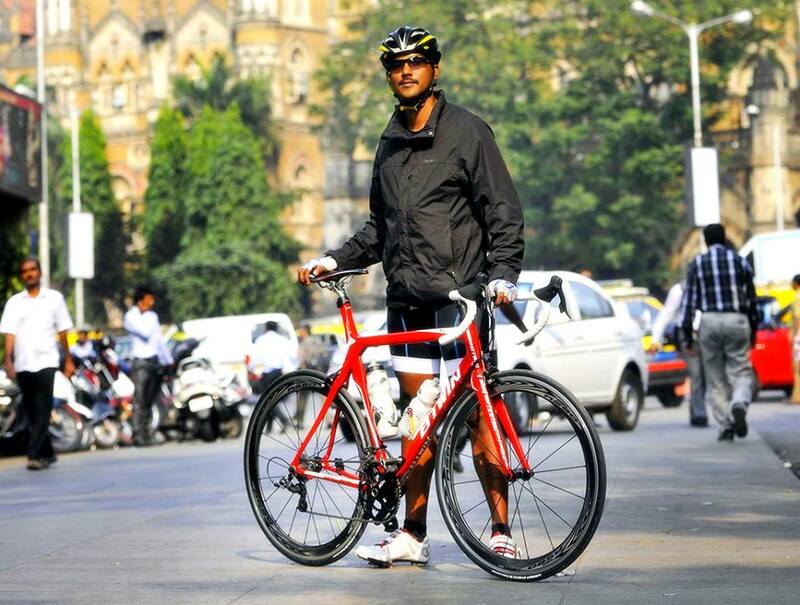 Once back in Mumbai, Sumit shifted to Pune to train for RAAM. It was based on a simple logic – exit to highways and good roads with less traffic takes longer in Mumbai as it is a huge city. It takes less time in Pune. But even as he trained, there were other problems cropping up. Big expensive projects like RAAM have multiple components. There is the challenge of raising funds; there is the question of finding the right people for support crew. 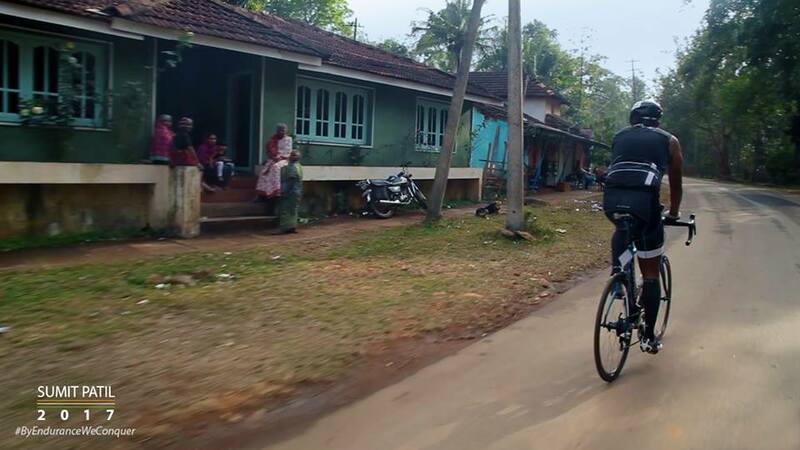 With endurance cycling and RAAM little known in India, raising resources proved a drag. Eventually the minimum required funds were pieced together thanks to two rounds of crowd funding and assistance offered by the Rotary Club of Mumbai, Worli. By then however, there were issues with the support crew. The original team Sumit had imagined – it featured some of the most experienced cyclists, managers and technicians around – didn’t seem keen to go along. A new team was assembled. But neither with this new team nor the earlier one, had he managed to put in long hours of training together. Mutual familiarity born from such training is critical for endurance races like RAAM. “ I tell people, it isn’t rider; it is rider plus support crew that win a race. Ideally the team should think for you. Sometimes if support crew is damn good, all a rider does is listen to what the crew says,’’ Sumit said. But most important of all, a rider won’t ride well if he has too many worries in the head. And that is what Sumit was beginning to face ahead of 2014 RAAM; the funds were in place only close to departure for the US and the support crew was relatively untested although he was happy that somebody came along. 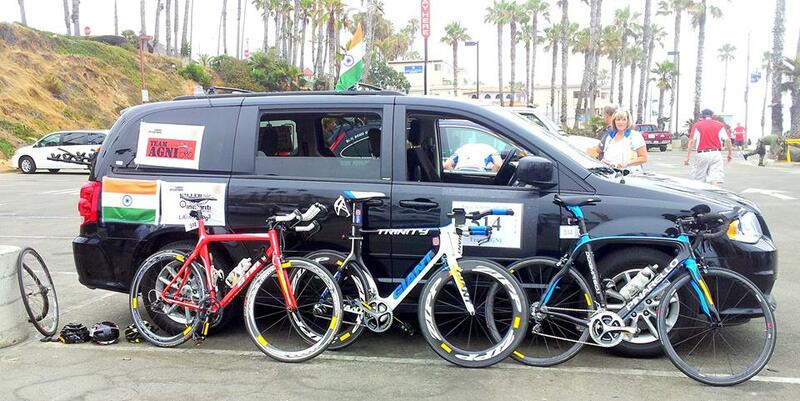 In California, the 2014 RAAM got off to a shaky start for Sumit. Lack of adequate work with support crew before the event meant that details like hydration and nutrition wasn’t as aligned to his needs as it should be. By day three, race officials informed that he seemed unlikely to meet the cut-off at Durango. Currently, besides Sara, Sumit owns four other cycles – Mukta (Pinarello Dogma 60.1), Toothless (Btwin Alur 700), Veronica (Giant Trinity) and a yet to be named Trek Madone. Given he had a stint as technical partner with Btwin in India, he also owned a Btwin FC 7 in between. Of these, Mukta and Veronica were bought specifically for RAAM. However bought with funds gathered for the purpose, they had been acquired late and were still new to Sumit. On the road in the US, this too was a problem. For the first time Sumit developed blood blisters from long hours spent on the saddle. 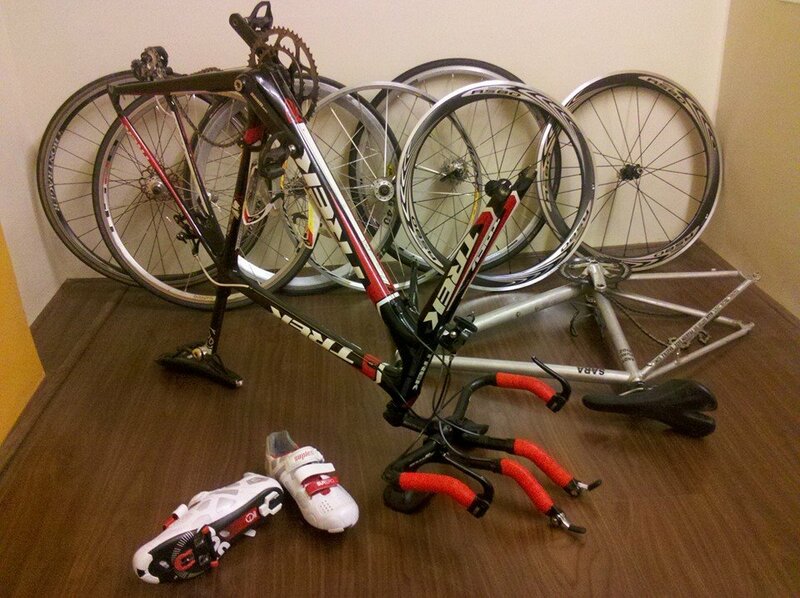 Shortly after his fate was spelt out by race officials, Sumit shifted to the Btwin FC 7, which he was familiar with. His pace picked up. One reason for this was tyre pressure. An experienced combination of rider and crew would calibrate tyre pressure to the sort of surface the bicycle is tackling. Mukta was mistakenly calibrated to smooth race track. Result – on the road, the high pressure kept air time (the time the wheels are in the air) high causing less traction. The Btwin didn’t have tyres that could hold air at such high pressure. So, even as the team continued to err on the tyre pressure front, the Btwin gripped tarmac and Sumit cruised comfortably. Noticing his improved pace, race officials relaxed the Durango cut-off and let him continue. However at South Fork, past the highest pass on the RAAM route and with approximately 1600 kilometers covered, Sumit pulled out. It was curtains for the 2014 attempt. On the bright side, according to Sumit, he learnt later that his RAAM attempt which had been back-ended into raising funds for charity had raised close to ten million rupees for a project distributing prosthetic limbs. Big cycling projects are like mountaineering expeditions. The echoes of actions taken continue long after expedition. With performance at stake, things are said in the heat of the moment. Misunderstandings occur. Sumit burnt some friendships. He regrets it; there is pain sensing the void that has crept in where good relations once existed. Then there are the obligations emanating from resources raised. His RAAM attempt may have ended but his responsibility to those who supported, continue even after event. It was a three year contract. Sponsors expect you to meet these obligations. In the process, an attempt to set a record, cycling India’s Golden Quadrilateral (the highway linking Mumbai-Delhi-Kolkata-Chennai-Mumbai) had to be sacrificed so that the demands of sponsors, who backed his RAAM trip, could be met. In world smothered by the triad of money, media and marketing what they ask you to do may not be agreeable if you are someone wishing sport to stay pure. Sumit had to swallow his reservations and go along. June 2018, when I met him, Sumit had become free of all these obligations. The shadow of 2014 RAAM was gone. But his attempts to go for RAAM post 2014, had all failed. In the meantime, the first Indians to finish RAAM had also happened – in 2017, Lt Col Srinivas Gokulnath became the first Indian to complete RAAM; he was followed by Dr Amit Samarth. Sumit’s latest RAAM qualifier had been the 2018 edition of Shivalik Signature, which he completed successfully in April. He was also registered for 2018 RAAM as Team Agni. However lack of resources decided otherwise. As Indian teams registered for RAAM made their way to the US or were already there, Sumit was cautiously sipping coffee with me in Prabhadevi. A coffee lover, he has been told to restrict his caffeine intake. Reason – he suffers from Ankylosing Spondylitis. It was diagnosed after PBP; symptoms had set in earlier. Ignored, this type of arthritis can be debilitating. One of the best ways to keep the condition in check is to remain active. That is a solid reason to keep cycling. Coming up therefore was something else; a segue from RAAM. Days after we met and a few days before the start of 2018 RAAM in the US, Sumit was scheduled to leave for Leh. Sometime in July, he will take up a project that seeks to improve a record he achieved in 2015. That year in September he had cycled from Manali to Khardung La, a distance of roughly 517 kilometers, in 71 hours, 28 minutes. The route features several passes – Rohtang (13,051 feet), Bara-lacha La (16,043 feet), Nakee La (15,547 feet), Lachulung La (17,598 feet) and Tanglang La (17,480 feet) before reaching Khardung La (17,582 feet). 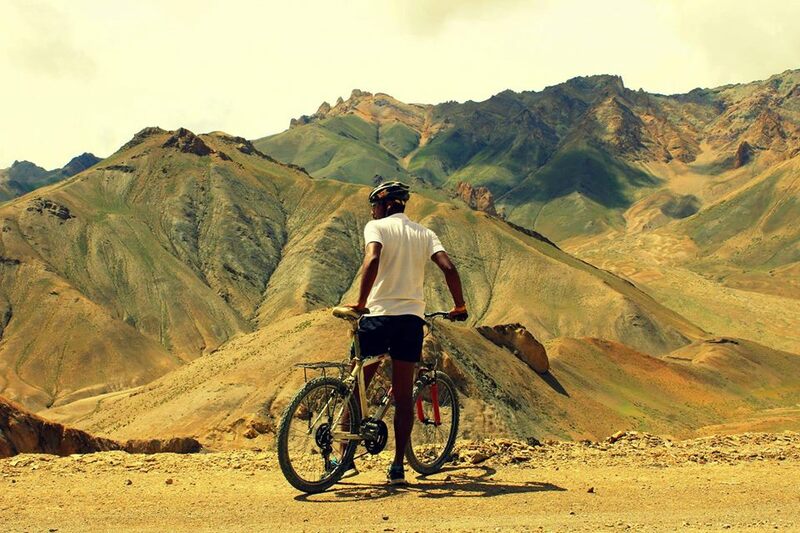 It gained him entry into the Limca Book of Records; the certificate awarded describes it as “ fastest solo bicycling across Himalayan passes.’’ According to Sumit, the choice of September for riding affected the time he took to finish. When you are riding with little rest, seeking record, you cannot decide when you will be on a high mountain pass. Sumit reached some of these passes in very cold circumstances. September is the beginning of winter. The real problem is in the descent. Wind chill adds to the cold and conditions can be quite unbearable for rider on bicycle. Consequently, he had to halt at times on descents, go down by car to wait out the cold, come back up to where he stopped and resume. This year, he plans to improve his record. He has chosen July for the attempt and believes that the halts of before may not be required in July’s temperatures. Daylight will also last longer, at this time of the year. The section selected is Manali-Leh and his goal is to cover the distance involved – approximately 490 kilometers – in under-40 hours. “ We hope to enter the timing in the Guinness Book of Records,’’ Sumit said. 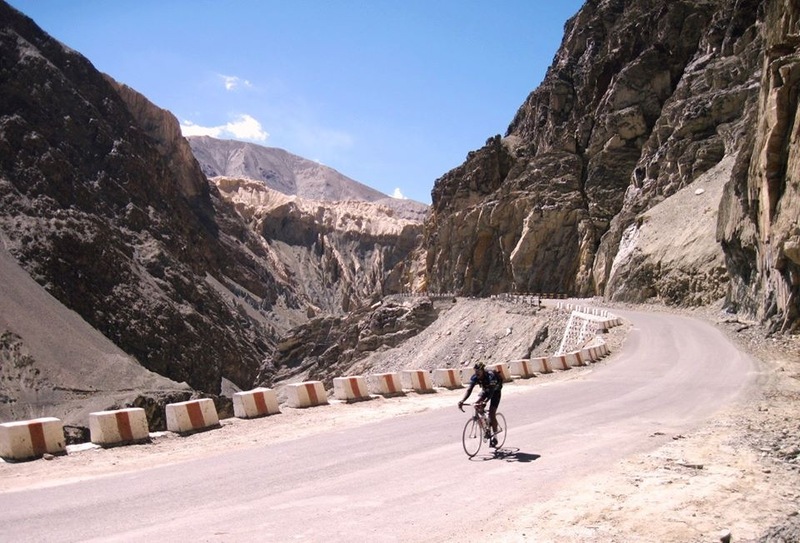 Both the Manali-Leh project and a similar attempt planned on the Golden Quadrilateral later this year, are steps towards showcasing endurance cycling in paradigm familiar to the public and thereby make cyclist deserving of support. The RAAM project lives.